Another year and another Ubisoft E3 briefing is at hand! This year will be a little different however because Aisha Tyler will not be hosting. This probably comes as pleasant news to some but a lot of people, myself included, really liked the personality and skill that Tyler brought to the shows. Ubisoft has a massive E3 ahead with a lot of exciting new titles coming in the near future. Rather than allow several of it's titles to get leaked, Ubisoft wisely announced a few ahead of time and we'll get to those later in the slideshow. The company has several sequels in the pipeline but each of them has more excitement than usual, not to mention a few surprised we believe may be on the way. But enough beating around the bush, let's get on with the predictions and, with any luck, we'll get more than a few right. Ubisoft managed to hold the next Assassin's Creed game a secret for longer than usual, but still, the game inevitably leaked before its official announcement. From alleged screenshots to a season pass and even a T-shirt, Assassin's Creed: Origins leaked in some ridiculous ways in the past month. 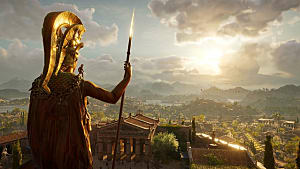 Ubisoft's E3 briefing will be the first official showing of the game however, and it's fair to say this is the most anticipated Assassin's Creed in a long time. You can blame Unity, glitches, and repetitive gameplay, but the reality is that fans simply became burnt out on the franchise and needed a break. Well, two years later and we're more than ready. Assassin's Creed: Origins is said to take place in Ancient Egypt and star a new protagonist by the name of Bayek. The game is expected to feature redesigned gameplay, vastly improved visuals, horse-riding, and a massive and seamless open-world. All of this and the game is said to be releasing this fall, fitting the usual reveal-to-release schedule for the series. I could be completely wrong but I can see Ubisoft starting the E3 showcase with Assassin's Creed and just addressing the elephant right away. The second South Park game from Ubisoft was revealed two years ago at E3, in what was a fairly unexpected announcement. After suffering two delays, the game is finally ready for release in October. We've already seen quite a bit from The Fractured But Whole but I fully expect another trailer, or gameplay demonstration from Ubisoft at E3. Due to the game releasing in a couple of months, Ubisoft will wish to keep it in the minds of everyone and get them excited again. If the sequel is anywhere near as good as The Stick of Truth, we'll be in for a treat come Halloween! The Crew 2 was announced in an earnings call by Ubisoft, then confirmed on Twitter with the new logo. The game is set to release in the current fiscal year, which ends on March 31 2018 - so we can guarantee a showing at E3. The Crew released in 2014 to mixed reviews but it did managed to accumulate 10 million registered players, meaning a sequel was fairly inevitable. New features are unknown as of now but it's fair to say that The Crew 2 will have to impress a lot more than its predecessor when it faces competition from the biggest names in the genre: Forza Motorsport 7, Need For Speed: Payback, and Gran Turismo Sport. Let's keep this one short and sweet. In the past year, Ubisoft has released Watch Dogs 2, For Honor, and Ghost Recon: Wildlands. These games have received varying degrees of success but none has set the world on fire. Regardless, support for all three of these games is unlikely to be concluded. Watch Dogs 2 has received five different DLC packs already but I wouldn't be surprised to see one more story-based DLC pack shown off at the conference. Despite selling even less than the original, the game has gathered a fan base and Ubisoft will want to show them faith. For Honor and Ghost Recon: Wildlands are a different story however. 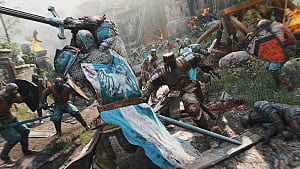 Despite charting well initially, For Honor only sold 1.72 million copies and it was reported this past week that the game has lost a gigantic 95% of its player base. That's horrendous news for Ubisoft but the company will definitely want to try and recoup those losses with some DLC to get fans back on board. Some decent DLC is probably a last throw of the dice for For Honor. Ghost Recon: Wildlands on the other hand, sold a little better and has retained a player base. A major expansion for Wildlands just launched, titled "Fallen Ghosts", and has been received well. This makes another expansion for the game this soon unlikely, however I wouldn't be surprised to see a quick trailer for the recent DLC. Here's something that tends to get predicted every year - well since the last instalment in 2013 - but it's bound to happen at some point. Splinter Cell is one of Ubisoft's best-known franchises, with combined sales of nearly 18 million units! 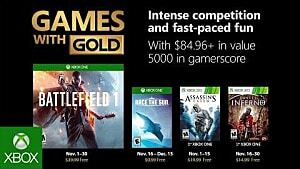 The last game in the series was Blacklist for PS3 and XBox 360 in 2013, and therefore plenty of time has passed for a new title to be almost ready to go. Not to mention, a supposed leak said that Sam Fisher's voice actor, Michael Ironside, had been spotted at Ubisoft Toronto. In a time when so few stealth games exist, a new Splinter Cell would be a welcome surprise to fans. We'd be very eager to see what a Sam Fisher adventure looks like in 2017 on PS4 and XBox One! Time for a complete change of pace. UbiArt Framework is a game engine created by Ubisoft to make smaller titles, the likes of which Child of Light and Valiant Hearts emerged! Those two titles were genuinely fantastic games and a sequel to Child of Light was confirmed by the developer back in 2015! It's been three years since the original title and I wouldn't be shocked if we seen a trailer for the follow-up. Or so I can hope. 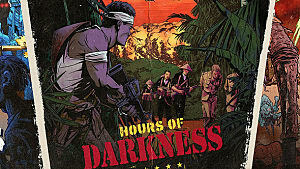 For what it's worth, a sequel to Valiant Hearts seems less liekly but no less desired. Moreover, we could very well see a brand new title emerge from the UbiArt Framework engine. Valiant Hearts was the last game made by the engine to release on either PS4 or Xbox One, so we're long past due a new title in the beautiful art style. Back to serious business, and that business is the awesomely-crazy, Far Cry 5! 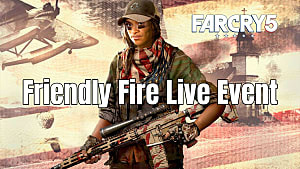 Just to get something out of the way, I do not understand the so-called "controversy" surrounding the game; it seems some people believe Ubisoft is trying to reflect the Donald Trump supporters in the American Mid-West. A notion that is simply ridiculous. 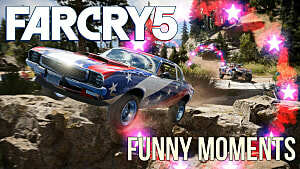 Far Cry 5 is releasing in the spring of 2018 and it is exciting! The mainline series needed a shake-up after Far Cry 4, and moving to the beautiful plains and mountains of Montana is certainly that. 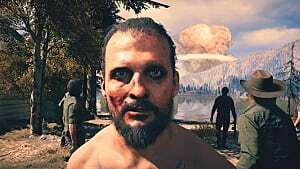 Brandishing Far Cry's signature brand of charismatic cult-leader, black humour, beautiful landscapes, and fanatical action, the new entry in the series is going to be a big deal. 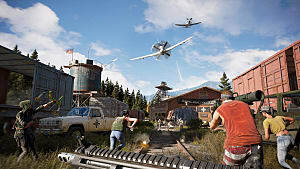 I would expect Far Cry 5 to almost get as much time at Ubisoft's E3 conference as Assassin's Creed, underlining how important the franchise has become to Ubisoft. I also think it could close the show...were it now for one more surprise announcement! Ubisoft can't help but close out it's E3 shows with a new IP we've never heard of. The company has done this every year since Watch Dogs was originally revealed, and more often than not it's a pleasant surprise. I expect this year to be no different. Of course, there's no way of telling what the new IP will be for sure, but we've already gotten a big tease. In a fantastic tongue-in-cheek mission in Watch Dogs 2, players sneak into Ubisoft headquarters and steal a new game trailer, then leak it to a games website for a nice fee. This trailer pops-up online and it shows images like the one above; weird spaceships orbiting planets with the tagline: E3_Conf_Video_v03. That's as on-the-nose as you can get when it comes to teases. Sources have said the game is indeed real and codenamed "Pioneer", although it was also reported that the game suffered a snag in development. This means the game is not a sure thing to be seen at E3 this year but, given Ubisoft's track record for revealing new IP to close the show, I'd still put money it. And there you have our Ubisoft E3 2017 predictions! For all intents and purposes, it seems like it's going to be a pretty great show for the publisher. With several huge games coming in the next year, from South Park to Far Cry, The Crew and Assassin's Creed, there's going to be a lot to show. 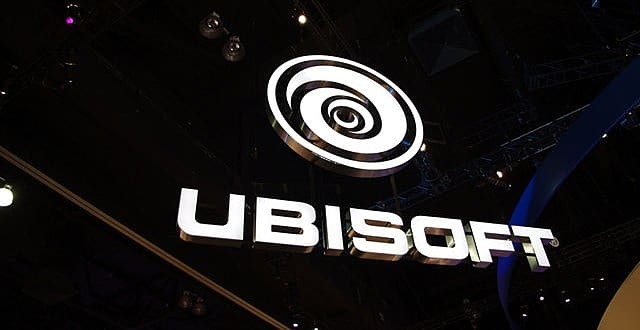 As well as the games we know about, Ubisoft is likely to have several unannounced titles that could steal the show, be it Splinter Cell 2, Child of Light 2, or the brand new IP. It's definitely an exciting year and, considering they've chosen for developers to host the briefing, it seems like games are going to be the focus. What do you think Ubisoft is going to show-off? Which game are you most excited for? Let us know in the comments and be sure to check out our other predictions! Until next time, stay tuned to GameSkinny!